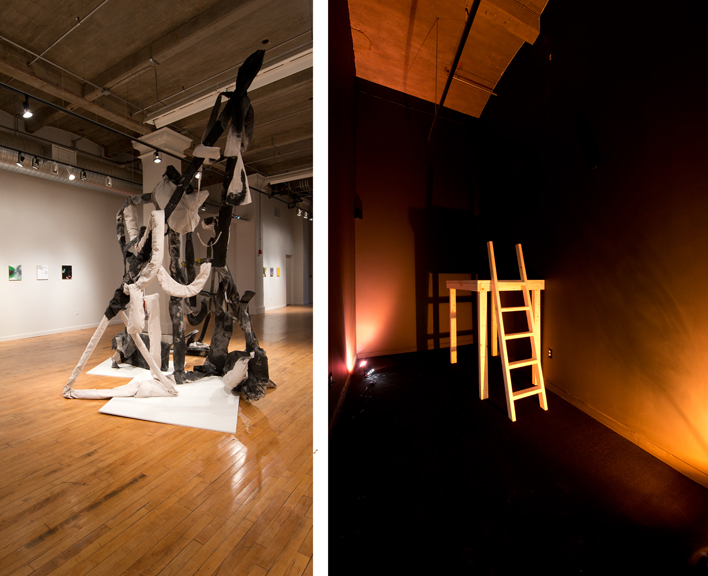 On its surface, the work of Shira Berkowtiz and Kristin Fleischmann Brewer is very different. Berkowitz creates sound and video pieces, pulling from various sources, both personal and from nature. Often minimal in approach, the results of these quiet explorations can be both calm and jarring: “solitude which might be a lovely thought, and the eerie places our minds wander when there’s quiet but not peacefulness”. Fleischmann Brewer’s work is based in painting but often takes form in sculpture, pursuing ambiguity between the physicality of the material and examining differences connecting abstraction and representation: “finding meaning through a dynamic cycle of production which includes formal strategies and a process of construction and deconstruction.” Through-lines between both artists work are speed (tempo), form (gravity), menace and delight. The resulting exhibition finds its cohesion where pacing and strategy both overlap and are at odds. Opening reception: Friday, February 6, 2015 from 6-9p. Additional hours for this exhibition will be Wednesday, Friday & Saturdays from 1-6p.